Longtime readers of this blog might remember that I’ve posted a few times on cultural tidbits that Ethiopian students at my school have shared with me. I’ve been blessed to hear their stories, to see their palm branch rings worn proudly on their hands after Orthodox Palm Sunday, to sense the pain of a community after bad news from their home country hit the airwaves. My students have given me a window into their world. I went searching for a book about an Ethiopian child after one of our students confessed to the librarian and myself that she had never read a book that was a mirror for her–one where she could see herself in the story. We had just finished watching Grace Lin’s amazing Tedd talk on books being windows and mirrors for kids, and how important that it is to find books where we can see ourselves in the pages, along with using them as a window to see how others might live and feel. After a Twitter inquiry, a librarian in the district suggested The Storyteller’s Beads, by Jane Kurtz, about an Ethiopian refugee family. It’s great, and I highly recommend it! 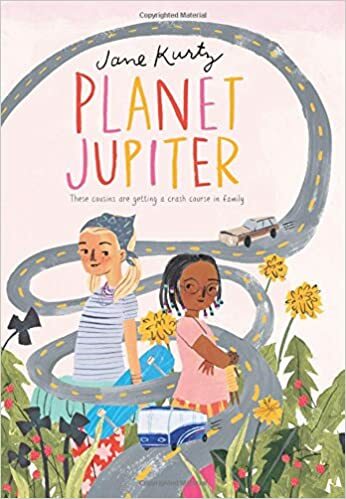 That book led me to agreeing to review the author’s newest book, Planet Jupiter, featuring an Ethiopian child who moves in with very unorthodox distant relatives when a series of tragic and sad events forced a big change in her life. This book won’t teach you much about Ethiopia (it hints at the Ethiopian’s Orthodox background when Edom, the child in need of a home, balks at eating pork, but doesn’t go any further in illustrating her faith or her life in Ethiopia), but it did provide me a very interesting window into the world of a child thrust into a very different family and into a very different culture. The way Edom and Jupiter–a very independent, free-spirited kind of girl–learn to relate and work together felt very authentic, filled with misconceptions and wrong assumptions, and eventually, a growing sense of respect and, well, family! The family Edom has made her way into is a family unlike any I have ever read about, which gave me a window into a completely different lifestyle from my own. Jupiter’s family “busks” music and goods at street festivals, and the next meal is always a little uncertain. The longing Jupiter feels for an absent father, whose ultra free-spirited ways make the rest of them look down-right boring, and her desire to be like him, tugged at my heart strings and made me feel sad for her. I have to admit that I felt a certain, underlying sense of anxiety through much of the reading of the book–probably because I very much like knowing where my next meal is coming from! If you wonder what it might be like, though, to be living a busking kind of life and to understand how hard it might be for the many immigrants and refugees in Seattle (and around the world), Planet Jupiter is a warm-hearted, unique place to start. This entry was posted in Being a Good Neighbor, Diversity, Writing and tagged Jane Kurtz, Planet Jupiter, Storyteller's Beads. Bookmark the permalink. 3 Responses to What can be a Window AND a Mirror? A Book, Of Course! Sonja, these sounds like wonderful entertaining and informing books. Thanks for the reminder that readers want to see themselves in the stories we write. Thank you for taking the time to read and comment! I’m glad you liked the post.